Preheat oven to 180°C. Place muffin cases in muffin tray/s. In a small suacepan, melt the white chocolate over low heat. Stir until smooth and coola t room temperature. In a large bowl, mix the cream cheese with the butter until smooth. Stir in the white chocolate, vanilla and orange flower water. Gradually stir in the icing sugar until light then add the cream. Mix together the eggs, caster sugar and brown sugar, then add the oil and vanilla essence. Stir in the grated carrots and crushed pineapple. In another bowl, mix the flour with the bicarbonate of soda, salt, cinnamon, nutmeg and ginger. Add the carrot mixture to the flour mixture then lightly stir. Add half of the walnuts and divide the batter among the muffin cases. 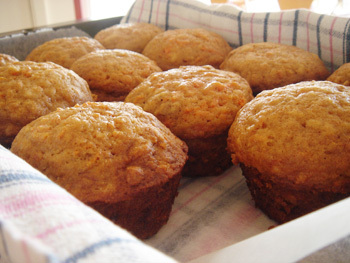 Bake in the oven for 25 minutes until the tip of a knife inserted in a muffin comes out clean. Cool completed on a rack before decorating with white chocolate cream cheese frosting and remaining walnuts.